If you ask a professional, a doctor for example, for advice, you rightly expect an answer that doesn't differ based upon whom you ask. If you ask a professional, a doctor for example, you rightly expect an answer that doesn't differ based upon whom you ask. We all recognize that there are a number of areas in life where the purported answer we receive depends almost entirely upon the person to whom the question is asked. If you ask a Chevy salesman for a car recommendation, it isn’t likely that you will be pitched a Ford. After a political debate, the various support teams race into the breach in order to “spin” the event in their favor. Each respective “good guy” is deemed to have done better than expected while the “bad guy” is said to have been disappointing. Of course my candidate won. When The New York Times asks someone already on record attacking what she sees as Duke University’s poisonous athletic entitlement culture to review a new book on the Duke lacrosse case that tries to make that very case, it is hardly surprising that she finds it “a masterwork of reporting and a devastating critique of a university that has lost its way.” When all you have is a hammer, everything looks like a nail. That’s why it’s so disappointing that so many financial services clients routinely get nailed when they seek financial advice from an industry that badly wants to be seen as professional. We do not have even a rough outline of what our best practices should be in a wide variety of common situations. If you were to ask 10 financial advisors (broadly defined) for help in any number of given situations, their advice and recommendations would almost surely differ wildly. As my friend Bob Powell of MarketWatch recently told me, a prospective financial services client seeking clarity is far more likely to find confusion, conflict and contradiction. To be fair, that variance is partly because there are relatively few clearly right answers in our industry, because two people who on the surface appear to have similar situations can have drastically different objectives, goals and risk profiles, and because there are multiple ways of implementing even agreed-upon solutions. Excellent physicians can disagree profoundly on treatment options for patients with medical conditions far more complicated than a broken leg. But that variance also exists because the barriers to entry in our industry are so low. Despite many extremely professional practitioners, it’s hard to call an industry a profession when licensing can be achieved in a very short time via only a quick cram course and a licensing exam. The investing and financial planning knowledge needed in order to obtain licensing is shockingly low. Just think, some guy who washes dishes can become a fully licensed “professional” and can take charge of assets it took a client a lifetime to acquire in just a few short weeks with no comprehensive training and no apprenticeship required. The fragmented nature of our industry makes things even worse. A good financial plan needs to consider at least investment, insurance, tax, estate and financing matters and options, but many would-be planners have experience in only one or two of those areas. It’s almost impossible truly to be an expert in all of these areas, of course, but the level of knowledge cross-over is far lower than is commonly assumed. Every advisor needs to know at least enough to recognize a potential need or problem in an area outside his or her core competencies, but many do not. Lots of excellent investment managers are ignorant of the financial planning or tax consequences of their investment choices, for example, to the detriment of their clients’ interests. Moreover, fiduciaries have a far different set of incentives motivating their behavior than even excellent non-fiduciaries do. A commission-based salesperson has different incentives than an investment advisor who is compensated by a percentage of assets under management, and both have different incentives than someone who works on a fee-only basis. These incentives can have dramatic impacts in the portfolios and lives of clients everywhere. Insurance agents who are not securities licensed have a tremendous incentive to recommend insurance solutions exclusively. Financial advisors frequently ignore guaranteed income solutions because they can lose control of the assets so deployed. Advisors of any stripe can be loath to bring in other experts for fear of losing control of the client relationship. Investment gains can be quickly undone by tax consequences. Poor beneficiary and legacy planning can derail an otherwise sound financial plan. In every corner of the financial world, products and solutions that are easy to sell are not always best for clients while products and solutions that are best for clients are not always easy to sell. And finally, there really are serious and important disagreements about best practices. What, if any, place should active management play in client portfolios? What about smart alpha or smart beta? How safe can any retirement income portfolio withdrawal strategy truly be? What’s the “Goldilocks” amount of guaranteed retirement income? Should the equity “glide path” increase or decrease as we age? Should our retirement planning focus be probabilistic or should we make sure we provide safety first? These questions and many more offer plenty of opportunities for excellent professionals of sincere goodwill to disagree and perhaps disagree a lot. No matter how data-driven we’d like and strive for our processes to be, financial planning involves less science and more art than any of us involved in it are pleased to admit. If our industry aspires to serious professional status—and it should—some major changes will be necessary. We can start by being much more honest about what can and can’t be promised or even achieved in the investment and financial planning worlds. The markets aren’t tame, no matter how much we’d like to claim otherwise. Risk and reward generally correlate. We can also work to heighten standards for everyone involved in financial services. We can seek to raise the barriers to entry for new advisors (requiring rigorous education about investing and financial planning would be an excellent start). But we should also raise the bar for existing advisors. More meaningful and robust continuing education mandates are an obvious need. Perhaps most importantly, we need to work harder to develop a culture of best practices to try to ensure transparency and good ethics as well as to clarify with some degree of specificity which matters are settled and which are not, together with clearer explanations of the nature and implications of those differences. The particulars are often difficult and complex, but many of the basics of good investing and good financial planning are remarkably straightforward and well understood. That they are avoided so assiduously and so often is to our great shame as an industry. That has to change. When all you have is a hammer, the best practice is to get more tools. And the tools we have need constant care and maintenance. 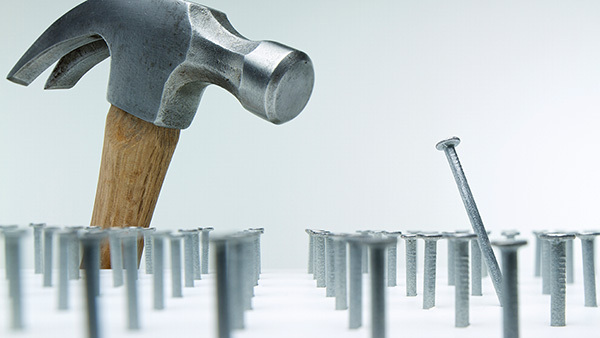 Far too many clients are getting nailed by underqualified advisors giving poor advice and offering poor solutions. As an industry, we need to hammer out a good set of best practices and a plan to put those best practices widely into use. If we don’t, we can hardly call ourselves professionals. Who’s the Easiest Person to Fool?